RAISE UR PAW NEWS: The Death of A King - Famous Lion Cecil Killed by Trophy Hunter. 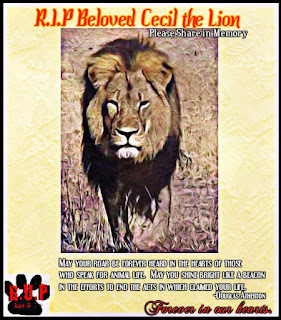 The Death of A King - Famous Lion Cecil Killed by Trophy Hunter. With a tsunami of outrage, and outpouring of sadness flooding media and social media about famous black maned lion, Cecil, being killed by a States Trophy Hunter, you can pretty much bet that the issues/concerns about trophy hunting will be in the spotlight right along with this story. According to sources and media articles, Johnny Rodrigues, chairman of the Zimbabwe Conservation Task Force, said in a statement "Mr. Palmer shot Cecil with a bow and arrow but this didn't kill him - they tracked him down and found him 40 hours later when they shot him with a gun. Cecil, who was known all over the world would have earned millions of dollars just from sightseeing. Walter Palmer apparently paid $50,000 for the kill." The death of Cecil should be an eye-opener and voice-raiser against "trophy hunting" - although the outrage right now is towards the American Dentist at this time, we should be putting it also towards those other so-called "hunters" who not only pay the big bucks for the slaughter of innocent life, but those who choose to disrespect and take photo ops of such ignorance and disgrace - finding enjoyment and thrill out of the kill. We must also acknowledge that when these "killers" pay these thousands of dollars to hunt these innocent beings, and permitted to do so by Governments, that is exactly what is on their mind - the trophy- many do not care whether the animals is famous or not, or whether they have babies etc... they want to leave the country with a "trophy" and you can be sure with that thought in their heads, many will go to great measures to achieve this goal. The death of this beloved animal should not be just a day of sadness and memory, but a day of shining the light upon this issue & joining united as one powerful voice to make a change & difference in the world - to be a beacon that shines light upon the concerns/issues of trophy hunting, and bring protection and justice for these innocent babies and make "Trophy Hunting" a thing of the past.